Southwest announced today that it will charge a flat $5 fee for wireless Internet regardless of device or flight length. This is a departure from most airlines’ policies, which use multi-tiered pricing schemes. So far, Southwest has installed in-flight wireless on only 32 planes, and plans to have 60 outfitted by the end of the year. Installation on all of the airline’s 737-700 planes (346 aircraft) will be complete by the end of 2012, and the full fleet will be finished by June 2013. CEO Gary Kelly said he estimates revenue from Wi-Fi to be in the $5 million to $10 million range in the first year. The $5 fee is technically an “introductory” price, but Southwest VP of Marketing and Revenue Management Dave Ridley said the price will stick through the entire rollout phase, well into 2013. At the moment, passengers must pay per segment, but Ridley said this will end in the near term and passengers will be able to make one $5 purchase for their entire flight. Southwest tested a wide range of pricing options, including tiered schemes and other flat amounts. Southwest will also offer limited free in-flight access, including a flight map, online shopping from SkyMall and Home Shopping Network, and access to southwest.com. At $5, Southwest is significantly undercutting the competition. On long-haul flights, Aircell’s Gogo service, which is far more ubiquitous than Southwest’s Row 44, charges $12.95 ($7.95 for mobile devices). On the shortest flights, Southwest and Gogo-equipped airlines are even, $4.95 vs. $5. Speaking of Gogo, a certain airline Southwest just purchased has its entire fleet outfitted with Aircell’s wireless service. It’s not clear what, if anything, Southwest will do to align the wireless service and pricing on AirTran’s planes with its own. The flat fee obviously creates inequity between consumers, since some passengers’ $5 will buy far more than others’. Travelers flying from Boston to Phoenix, for example, will get a lot more Internet for their $5 than someone flying from St. Louis to Dallas. Southwest probably assumes people are more likely to purchase wireless on long-haul flights than on short ones, but chances are the lack of a cheaper short-haul price will dissuade passengers who might otherwise make the purchase. 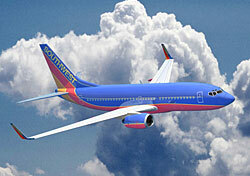 Readers, what do you think of Southwest’s in-flight wireless plan? Does the flat $5 fee make you more or less likely to log on?